What’s Wrong with the VDP Classification Model? The Verband Deutscher Prädikatsweingüter (VDP)—which was founded in 1910, and whose members have an eagle bearing a grape bunch on either their capsule or label—is an association of many of the leading German wine estates. For the most part, its various regional associations (including the Grosser Ring – VDP Mosel-Saar-Ruwer) have mostly phased out the Prädikat designations Kabinett, Spätlese, and Auslese for trocken (dry) and halbtrocken ("half-dry") wines. The VDP chooses, instead, to keep the predicates for residually sweet wines. No special attribute is really needed—according to them—for dry and off-dry wines to show the ripeness level or to highlight that no sugar was added to the grape juice during fermentation, also known as chaptalization. The VDP's focus is on their deluxe dry wines that must come from a VDP.Grosse Lage, or a VDP-only grand cru. (This and other VDP terms are written in all caps.) These high-end dry wines are branded as VDP.Grosses Gewächs, or "great growths," better known as GGs, an abbreviation that is marked on the label and often embossed on an extra-tall, heavy bottle. Any other dry wine from a Grosse Lage—not to be confused, of course, with the large, collective site known as Grosslage—is downgraded to either an Orts- or Gutswein, a village or entry-level estate wine. Moreover, a Grosses Gewächs doesn't have a Prädikat, and thus is a Qualitätswein, formerly called QbA (Qualitätswein bestimmter Anbaugebiete, or a "quality wine from a particular growing region"). In other words, a GG can be sugared during fermentation to raise the wine's alcohol content. In Germany, unchaptalized wines are still important to many growers and customers, so it's odd that the high-end dry wines of the Prädikat Wine Estates—which is the VDP's official name in English—don't even bear a Prädikat, even if chaptalization is normal in Burgundy or even Bordeaux. Supposedly, some members would like to change the name to Verband Deutscher Prestigeweingüter, or Prestige Wine Estates, which is rather pompous. Most of the Grosser Ring members—with some notable exceptions, such as Joh. Jos. Prüm and Egon Müller—produce a Grosses Gewächs, even though the majority of them specialize in the fruity to nobly sweet wines. One of the early backers of GG is Annegret Reh-Gartner of Reichsgraf von Kesselstatt. She is also the only Grosser Ring member that still uses the heavier, taller, 350-mm bottle with the embossed "GG" symbol. The others just have a taller 350-mm bottle for their GGs, although Ernie Loosen of Dr. Loosen has his with an engraved GG symbol, including those labeled "Alte Reben," which come from over 100-year-old vines. Moreover, he has begun to release Grosses Gewächs Reserve wines. These have an extended lees contact of 24 months in large oak casks. 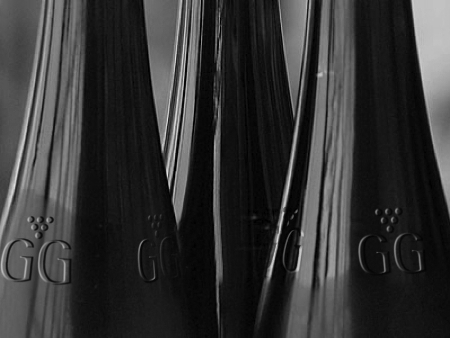 The bottles have an engraving of GGR and are topped with white wax capsules. In any event, the packaging is meant to distinguish GGs from other wines. Although Mosel producers made (pre-1971 Wine Law) feine, feinste, or hochfeine Auslesen and even Spätlesen from around the 1920s onwards, the wines from, say, the 1960s were different from those produced in the Mosel's heyday. In the 1890s, Auslese was the only Prädikat of note and was usually made from botrytized grapes; most other wines tasted rather sprightly and dry. Of course, it's easier for consumers who know less about the history of German wines to remember that a Prädikat on the label means sweet. Besides, the export markets are more familiar with these wines. It should be noted, too, that many producers focused on sweet wines in the 1960s and 1970s. The terms "trocken" and "halbtrocken" came with the new law. For example, Maximin Grünhaus made it's first Kabinett trocken in 1979. 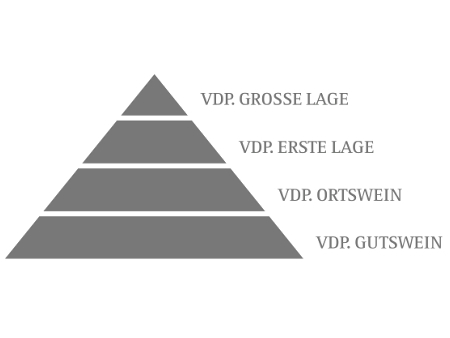 The VDP classification model, shaped like a pyramid, now includes four different levels, similar to Burgundy: Grosse Lage (grand cru), Erste Lage (premier cru), Ortswein (village wine), and Gutswein (basic "estate wine"). The VDP formerly only had three levels, with Erste Lage as the top site—hence the Erste Lage symbol—a numeral 1 next to a cluster of grapes—on the label or embossed on a big bottle for GG. The VDP Mosel-Saar-Ruwer, however, chose to stay with three levels, so Grosse Lage replaces Erste Lage at "the peak of the pyramid." Although the VDP has spearheaded this movement of dropping the Prädikats on dry and off-dry wines, there were forerunners. In the early eighties, the Charta association in the Rheingau, whose president was the late Bernhard Breuer of Georg Breuer, promoted dry to medium-dry Rieslings without a Prädikat or single-vineyard name. The wines could be up to 18 grams of residual sugar per liter, or halbtrocken. By this time, there was a shift in Germany from sweet to dry wines. In the Mosel, Heymann-Löwenstein and later Van Volxem, which, at the time, weren't members of the VDP, focused more on single-vineyard dry-tasting Rieslings without Prädikats. These two estates also avoided producing Grosse Gewächse (though Löwenstein has finally begun to bottle some wines as GG). Over the years, one of the big problems of the VDP classification model are all the changes, which bring with it all sorts of qualifications and complications. The average consumer has no chance to untangle everything, especially with many producers having their own internal classification system. For the new VDP classification, Grosse Lage should, ideally, be listed without the village name on the front label. Hence no Ockfener Bockstein (from the Bockstein vineyard of Ockfen). It's just Bockstein now. The VDP is trying to emulate Burgundy once again. This is problematic because there are many sites with the same name, such as Kupp, Herrenberg, or Schlossberg. Ockfener Bockstein is considered, along with Scharzhofberg, to be one of the very best sites on the Saar and was historically listed as just "Bocksteiner" or "Bockstein." But most single vineyards included the village or town, with an adjectival -er ending, plus the site name, much like the vintage 2014er (from 2014). This is the possessive form. Other wines were just named after the village. In the 19th century, most wines were listed only by the village, such as "Graacher" or "Saarburger," and had little to do with the current VDP classification model, and some of the explanations that I've heard for the classification are based on a pseudo-history. Another issue is that certain VDP estates, such as Karthäuserhof and Schloss Saarstein, have only one single-vineyard site, which happens to be rated a Grosse Lage. Yet they can only produce one dry wine with the name of the vineyard on the label. Over the past decade, especially since the uneven and rather difficult 1957 vintage, there has been a steady trend in Germany in favor of a less rigid and more practical attitude toward the sugaring or chaptalization of lesser wines. This has partly been due to an effort to bring the German and French wine laws into closer accord—in the interest, hopefully, of a future Common Market. Since almost all Burgundies are chaptalized, even in great years, and most Bordeaux in secondary vintages like 1956, 1960, 1963 and 1965 (without bearing any indication of this fact on the label), many of the best German producers have come to feel that they, too, might legitimately follow a somewhat similar procedure—sugar and ferment and age and bottle their own lesser wines, especially in poorer years. In the past, instead, they had sold either the grapes or the new-made wine to shippers, for handling and blending. That’s why Koehler-Ruprecht still keeps to the 1971 Prädikat system and left the VDP, as they want to designate that their wines, including the dry and off-dry ones, are unsugared, or “natural” (see "Koehler-Ruprecht Leaves the VDP" for more on this). The VDP’s new classification model doesn’t differentiate between a chaptalized or unchaptalized dry wine anymore. The VDP discourages its members from labeling a wine for an Ortswein or Grosse Lage as Kabinett, unless it has between 18 and 60 grams of sugar per liter. It seems many Kabinetts are well above 50 grams. The idea, though, is to keep this Prädikat for those members—especially in the Mosel, Nahe, and Mittelrhein—who are still making "fruity-sweet" Kabinetts. Otherwise, a Kabinett wine is classified as either a Gutswein, if it has less than 18 grams and comes from a Grosse Lage. A Kabinett feinherb can be from 18 to 30 grams. (This means the sweet spot between 9 and 18 grams gets ignored.) If a member wants to use the term "Kabinett trocken," it has to be demoted to a Gutswein without the single-vineyard name. More nonmembers are following along now. This, however, goes against the notion of terroir and the tradition of a dry and dry-tasting Naturwein, or natural wine, especially in the Mosel. Images courtesy of the VDP. More on the VDP classification model: David Schildknecht on what's the matter with Grosses Gewächs. Thanks you for the article. I’m not going to try to respond to everything right now, but you raise a lot of good points. The VDP classification system isn’t perfect by any means, but in my opinion, it’s been a big step in the right direction by drawing more attention to many of the best sites; even if the list is flawed, and those of nonmembers are excluded. The VDP wants to emulate Burgundy, but it’s also clear that the Burgundian classification of Grands Crus isn’t perfect, either. Otherwise, we wouldn’t have producers there wrangling to get their best Premiers Crus, like Les Saint Georges, changed to Grands Crus. (Of course, the INAO is a state-run organization, whereas the VDP is a private one.) A revision of the 1971 Wine Law with a all-inclusive classification would be better still, but I don’t see it happening anytime soon. Debate is always going to be inevitable with any classification. Verband Deutscher Prestigeweingüter just sounds wrong, even if ‘Prädikatsweingüter’ has become irrelevant. Then again, I’m sure it sounds great to a marketer. Plus, there are some underperforming VDP estates whose wines are hardly “prestigious” right now. I wasn’t aware of Ernie Loosen’s GGR wines. The only GG of his that I’ve had was disappointing, though. Anyway, I’ll be very interested to read others’ responses over the next few days. You’re right that the VDP has brought “more attention to many of the best sites.” It has also been very important in improving the reputation of German wines. Ten years ago, the landscape was much worse. Owen Bird writes about this in his book titled Rheingold: The German Wine Renaissance (arima publishing, 2005). He was hoping that the VDP would do something and create a prestige category. I also agree with you that a classification, including the one in Burgundy, will never be perfect. In addition, the Mosel has so many great sites. Lars, when I read the title of this post I thought we were in for a much more scathing criticism! I admire your coolheaded way – you raise many great points and I’m glad that you wrote this. – I love dry Riesling. I also love sweet Riesling and every step in between. But the reason that I drink more German Riesling than anything else is for the stunning spectrum of styles that it achieves. I almost feel embarrassed for the VDP when they take so much pride in dry wines to the exclusion of all others – making great, powerful dry Riesling is a commendable achievement, but not a unique or unprecedented one! I would, however, argue that making great, featherweight but ageworthy, low-alcohol Riesling of varying levels of sweetness is a virtually unparalleled accomplishment. Why isn’t there more focus here? – Lars, something that you didn’t mention, and I know your focus is primarily Mosel, is that the Rheinhessen chapter of the VDP (and perhaps others that I don’t know about) forbids the simultaneous labelling of Kabinett and single-vineyard wines, even if the vineyard is a “top” site. Perhaps this is to say that the Kabinett style is so lacking in sophistication that it corrupts or at least obscures the virtues of a grand terroir?!?!?!? I know that Kabinett in the Rheinhessen is a rare phenomenon, but to cite a recent example, Wagner-Stempel of Siefersheim produced a Kabinett from the Heerkretz site whose best parcels are exceptionally privileged. Kabinett is far from the estate’s goal, but I was told that nature dictated this style of wine in this vintage and they are very happy with the results, and so am I. In fact, within the first 48 hours of the wine arriving in Canada, my colleagues and I consumed 5 bottles at the shop during store hours! It’s an enticing, complex and utterly delicious wine… but God forbid that consumers learn that it’s from the Heerkretz vineyard! They should certainly be protected from this information! (Or is it that the grand Heerkretz vineyard shouldn’t be publicly shamed by the fact that it spawned a wimpy Kabinett wine?). – A few weeks ago I was conducted a GG tasting for wine professionals in my city. Of course I showcased what I feel to be the most exciting examples of the category, but it wasn’t a promotional tasting – in fact, my prime objective was to discuss the contentious issues surrounding the style. At one point during the tasting, somebody asked about the pricing of GG wines, not because they felt that the prices were unfair for the better examples, but because they were curious why GGs in general were exceptions to the idea that German wine is horrifically underpriced. Of course I had considered the prices of these wines before, but never had it dawned on me that perhaps something pre-ordained was at play. For example, does it really cost Spreitzer significantly more money to produce their Rosengarten GG than their Winkeler Jesuitengarten Kabinett Feinherb? Does it cost Dönnhoff more to make their Hermannshöhle GG than their Hermannshöhle Spätlese? Maybe it does, I have no idea, but is there a chance that the VDP makes suggestions or recommendations to their member for ex-cellar pricing of their GGs? I would be interested if anybody has an answer to this because it would make sense to me – it seems that it would be important for a prestige category to have a consistently high prestige price. Thanks, Al. I appreciate your additional points. Both David Schildknecht and Terry Theise have also said that there’s more to great terroir than producing GGs. My beef is that the VDP downgrades light, dry-tasting wines; it makes an exception for the fruity ones. Yes, I remember David Schildknecht telling me that Klaus Peter Keller couldn’t label the single-vineyard name of one of his (fruity) Kabinett wines. It came from a Grosse Lage, too. I’ve visited Wagner-Stempel a couple of times. On a long hike with my then-girlfriend, we went through all the different sites. It’s ridiculous that Heerkretz can’t be on the label for a Kabinett wine. I don’t believe the costs of production for a GG wine is necessarily more expensive, even though there are restrictions on yields (50 hl/ha). An extra cost is the taller and heavier bottles. As far as I know, members are required to charge a higher price for GGs. I don’t know the minimum amount, though. Yesterday, I asked David if I could finally publish his (old) views on GGs, but he has yet to give me permission. Al: A lot of good comments here. Regarding pricing of GGs versus Spätlesen, Robert Weil seems to be an exception. I’ve consistently seen the Gräfenberg GG going for less than the Gräfenberg Spätlese. Of course, Weil’s Gräfenberg Spätlese is one of the most expensive Spätlesen. I also agree that there are many exciting Kabinetts being made outside the Mosel, and not to be able to label them with the name of a Grosse Lage is ridiculous. At some point, I need to look at the price list from Robert Weil. Is the Mosel the only region that allows its members to label a residually sweet Kabinett from a Grosse Lage? I tried reading the VDP’s classification model page in English, and if I didn’t know better, I would think that Every region allowed a residually sweet Kabinett from a Grosse Lage. Then again, the page also claims that pradikatsweine from Grosse and Erste Lagen have to have at least a Spätlese-level sugar content. (I wasn’t aware of that.) Perhaps something got lost in translation along the way. My impression was that the Rheingau Charta group led the offensive against the Kabinett pradikat, as they saw it as a 1971 corruption of their old ‘Cabinet’ designation, which was summarily sent the way of Feinste and Hochfeine. I’m not that familiar with VDP regulations in the Mittelrhein, but wouldn’t be surprised if they allow Grosse Lage Kabinetts there. No idea at all about Hessische Bergstraße or the two former East German regions. This would probably be something that David can answer. Interesting that the Weil GG and Spätlesen are priced the same in a normal vintage. I’ve bought the 2002 and 2005 GGs – not on sale – for barely more than half of what the Spätlesen from those vintages would have cost me. Maybe this is changing, with Loosen taking over from Rudi Wiest as the US importer. I have not seen the last couple of vintages for sale around here yet, although the 2012 GG was quite impressive at a tasting earlier this year. Thank you for your comments, too, Al. Andrew, I double-checked the VDP’s German page on classification. It’s true. Both Grosse and Erste Lage have to have a minimum must weight of 85° Oechsle, or Spätlese. Then again, most of today’s Kabinett wines from quality-conscious growers exceed 85° Oechsle. The Charta association, as I understood it, wasn’t as focused on Kabinett, but more so on Spätlese and Auslese. The Charta wines were riper than Kabinett. The traditional meaning of Kabinett, or Cabinet, was to highlight the finest Rheingau wines, especially Auslesen. David should know more about the VDP Mittelrhein. I’ll need to double-check, but I agree that not all Rheingau Grosse Lagen have a tradition for producing great Spätburgunder, such as in Assmannshausen. In fact, it’s the only place in the Rheingau that was really known for its red wines, which were long considered the best in Germany. Lorchhausen also was known for small quantities of red wine. One more thought/question: The aforementioned Wine Atlas of Germany openly questions whether most of the Rheingau Grosse Lagen are indeed great sites for growing Spätburgunder – Assmannshauser Hollenberg being an exception. Just because a site is capable of producing excellent Riesling doesn’t mean that it’s necessarily suited for Pinot Noir. Has the VDP caved to its members by designating largely unproven sites as GLs for Spätburgunder in the Rheingau or any other region? Thoughts? Andrew, that’s certainly valid and perhaps my point regarding pricing lacked some clarity. Mostly what I was arguing is that the GG category of German wine seems to be the only one that is uniformly expensive (with the obvious exceptions of BA, TBA and eiswein), even if in some grower’s lineups there are occasionally other wines that match or exceed those prices. Lars, I’m not surprised to hear that minimum pricing might be in place (if I’m not taking too many liberties in interpreting your answer this way?). Back to Andrew, I also like your point regarding the generosity of the Rheingau to accommodate Pinot Noir in every single Grosse Lagen of the region! It’s clear that the VDP wants GG to be their premium category, with the exceptions you mentioned for certain regions. Al, I once heard of a minimum price for GGs a few years ago, but I forgot what it was. I’ll need to ask a VDP member again. Mathias Ganswohl of the VDP.Rheingau says that they don’t have a minimum price for Grosses Gewächs, but it should be 2.5 to 3 times the price of a Gutswein. Most producers have a price of over 20 euros for private clients. He also says that VDP.Rheingau members last produced Erstes Gewächs for the 2011 vintage. Since the 2012 vintage, it’s now Grosses Gewächs for VDP members. He also agrees with my criticisms of the VDP classification model. One Rheingau producer has only two monopole sites that are rated Grosse Lage and can only use the site name for a dry wine when it’s a GG. Any other dry wines have to be downgraded to an Orts- or Gutswein. A Rheingau producer is technically allowed to put the Grosse Lage name for a Kabinett, but it has to be a residually sweet Riesling. Ganswohl, however, says that almost all VDP producers only make Spätlese and above. The one exception is the Hallgarten Jungfer Kabinett Goldkapsel auction wine from Prinz. In addition, Ganswohl believes that there will be a trend toward more moderate alcohol levels for the top-end dry Rheingau wines in a few years. In the Pfalz, he says, it will be more difficult, because sugar ripeness is often way ahead of phenolic ripeness. Ganwohl says that all Grosse Lagen can be planted with Spätburgunder to make a GG. He, however, points out that the wines have to be approved by a tasting panel and meet certain requirements. He realizes, too, that Assmannshausen is the only place that has a long tradition of producing top Spätburgunder in the Rheingau. I appreciate his candidness during our phone conversation. Florian Lauer also says that Grosses Gewächs is usually about three times the price of a Gutswein, so a Gutswein for 10 euros would mean a GG for 30 euros. He says that a fruity Kabinett can be made in the three different categories: Gutswein, Ortswein, and Grosse Lage. On the other hand, a Kabinett trocken/halbtrocken can only be a Gutswein (no village or site name, even if it comes from a Grosse Lage). By the way, Martina Weil has yet to send me a price list to confirm whether they charge they same amount for their 2014 Kiedrich Gräfenberg Spätlese and GG. She did, however, give me the email address of Mathias Ganswohl of the VDP.Rheingau. Martina Weil sent me a list of 2014 selections and the price for the 2014 Gräfenberg GG. It’s 32.70 euros (without MwSt., or value-added tax). She didn’t have a price for the Spätlese, as quantities for their fruity and nobly sweet wines were miniscule. These will be sold at auction. This is some great digging – I for one appreciate the proverbial legwork. You’re welcome, Al. Thanks for your comments. Last week, I found a retailer in Boston that has a few bottles of the 2011 Loosen GG Reserves. The Würzgarten is going for $95, which is comparable to their Riesling GGs from Rebholz and Wittmann (both which tend to be among the more pricey ones in my experience). Meanwhile, the Prälat is $169, which is into Clos Ste. Hune territory. Needless to say, it had better be a superlative and unforgettable wine. Thanks for quoting the high prices of Dr. Loosen’s 2011 GG Reserves.